Following 9/11, and given the high level of religiosity in the U.S., religion has emerged as an important dimension of immigration, hate crimes and discrimination. With that in mind, the Milstein family has been an ongoing major supporter of the Tanenbaum Center for Interreligious Understanding, where Howard Milstein serves as a Founding Member of the Leadership Council and has been honored with the Corporate Bridge Builder Award. In ways that couldn’t have been predicted even a decade ago, religion is squarely at the forefront of domestic and global issues: Presidential politics, international security, health care, sectarian conflicts. The Milsteins recognize that religion need not be a divisive social force. Through Tanenbaum, they confront religious ignorance and violence with support for results-oriented programs that reduce hatred and produce real change. The Tanenbaum Center builds on the work of its namesake, Rabbi Marc Tanenbaum, whom the Milsteins came to admire through their involvement with the American Jewish Committee. After his death, they funded the writing of A Prophet for Our Time: An Anthology of the Writings of Rabbi Marc Tanenbaum, published by Fordham University Press. 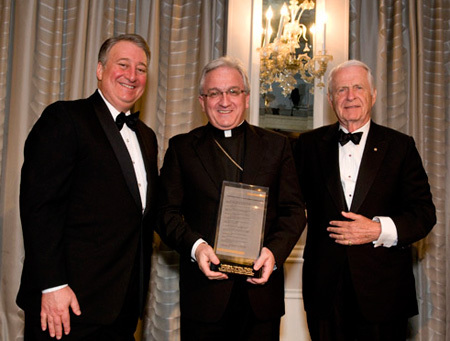 Howard Milstein and Ambassador Robert Shafer presenting the Rabbi Marc H. Tanenbaum Award for the Advancement of Interreligious Understanding to His Excellency Archbishop Celestino Migliore at the Pierre Hotel, June 10, 2010.